Hon. Kameeta, Ohorongo, Buildit & Omaheke local- regional leadership witnessed this milestone. Over the past 2 years, nearly 300 Namibians have received training from the Ohorongo Buildit Brickmaking Academy on how to produce quality bricks. This was declared at the 14th brickmaking training session in Gobabis, Omaheke, yesterday (18 July). The Ohorongo Buildit Brickmaking Academy is the result of the Smart Partnership between Ohorongo Cement and one of its customers, the Buildit Group, which was established in March 2017. The main purpose of the Brickmaking Training Academy, is to support the Namibian Government’s development policies, as well as poverty eradication efforts. 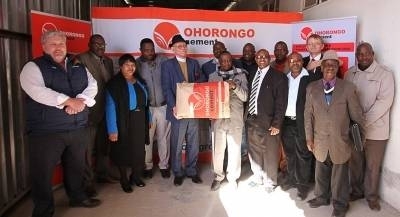 The Minister of Poverty Eradication and Social Welfare, Honourable Bishop Emeritus Zephaniah Kameeta, applauded Ohorongo Cement and the Buildit Group for their commitment to provide brickmaking training in each of the 14 regions of Namibia, thus ensuring that nobody was left out. All trainees have received vocational training in the trade of brickmaking through the transfer of skills & knowledge, a key building block towards economic transformation. The number of trainees exceeded the initial target of 210 trainees over a period of two years. “We expect the trainees to use their newly acquired skills to assist in employment creation, enabling them to not only sustain their own livelihoods, but to play an active role in the alleviation of poverty”, explained Hans-Wilhelm Schütte, M.D. of Ohorongo Cement, enthusiastically. The Minister encouraged the trainees to create their own employment, instead of looking for employment. If all trainees would again teach others, and each would employ only 2 additional people, this Academy has the potential to create close to 900 additional jobs for Namibians. Hon. Kameeta further noted that he was happy to see representatives of the National Youth Council at the event, as it was a clear indication that there is great potential in the skill of brickmaking. The Ohorongo technical team provided training and guidance on the right aggregates that is most beneficial to use during the brickmaking process. “With brickmaking, a small thing can have a huge impact on the quality of the bricks. A mistake many people make, is to use water that is not drinkable,” said Festus Katofa, one of the Ohorongo trainers. The Omaheke Regional Council took immediate action and committed to provide each trainee from each of the 7 constituencies, with 20 x 50kg bags of Ohorongo Cement to start using their skills immediately. “To show further support, Buildit has committed to provide another N$ 10 000 towards an irrigation project within the region.” “On top of the 20 bags per constituency, donated by the Omaheke Regional Council, Buildit will add another 10 bags, so that each constituency will receive 30 bags,” said Paul Hinson, Category Buyer of Buildit. “Without the assistance of the various Regional Governors and the different Constituency Councillors, it would’ve been nearly impossible to have made a success out of this initiative,” said Schütte. “They played a vital role in identifying enthusiastic trainees to receive the training at no cost to them,” he said. Each trainee also received a guidebook to take home for future reference. Beyond the training, the Ohorongo Technical Team, together with a support team from the Buildit stores, will continue to provide some technical assistance and advice to the trainees, in order to ensure the best outcome in the production of high-quality bricks. NOTE: Ohorongo Cement / Buildit are not qualified training institutions and cannot accredit any individual after training has been done. Training is done solely in support of Harambee, transfer of skills & knowledge & job creation in order to empower people on community level. The Omaheke brickmaking training in Gobabis delivered thirty four newly trained brickmakers.